As a part of our inspection service, Conley Home Inspections sets up for each of our clients a free lifetime subscription to HomeBinder ($120 value). HomeBinder allows our clients to organize and save all their related home information and records in a convenient online application. As examples, this could be anything from storing paint colors by room to receiving email home maintenance reminders. HomeBinder is designed to help get your home ownership off to a great start. It will ensure that for future reference you have all of your home details that you may need right at your fingertips. Maintenance Reminder Email Alerts – Automated alerts reminding you to change batteries, filters and more! Document and Photo Storage – A storage location for all of your home-related documents and photos. Recall Alerts – Automated emails to alert you in the event of a recall occurs on one of your appliance or mechanical units. Planning Projects and Renovations – The HomeBinder support staff will help you plan projects, find highly rated contractors and see your project through to the end. Setting up Utilities, Cable, Internet, TV, Phone, Home Security Systems – The HomeBinder staff can outline the options available in your area and help you get things setup! But only if you ask for it. Best of all, Conley Home Inspections will begin the setup of your HomeBinder to minimize your effort to begin managing your greatest asset. At a minimum, we include a maintenance alert schedule (which you can adjust) and your inspection report, so you’ll get emailed maintenance reminders about key home tasks and always have access to your inspection report. Although you’ll probably not think about selling your home for some time, if you ever do, your HomeBinder will help out with the selling process for buyers, your accountant and the appraiser. Here is an example of a pre-listing HomeBinder Report. All of the services that are provided by HomeBinder will be FREE for you to use for as long as you live in your home! Soon after the inspection, you will get a welcome email from HomeBinder with a link to access your personalized binder. All you do is pick a password and you will have secure access to that binder going forward. Also, you can share the binder with your spouse or family member. If you need help, you can contact HomeBinder at support@homebinder.com or 1-800-377-6915 or go to www.homebinder.com. Clients can watch this video and read this flyer! Agents can watch this video and read this flyer! At Conley Home Inspection, LLC we provide all of our clients with several Home Inspection Guarantees through Complete Protection. This has become a standard in the industry with reputable home inspectors. Having Home Inspection warranties in place will provide you with peace of mind especially since Complete Protection has superior coverage and was the best I could find on the market. Complete Protection has been offering award-winning service to home inspectors in the United States and Canada since 2006. It is only one of two home warranty companies in North America to receive Angie’s List Super Service Award, and they have won it twice. The 90-Day Guarantee is valid for 90 days from the day of inspection and has no dollar caps on repairs with no deductible or copay. Also, included separately are 90-day Mold & Sewer protection coverages, plus a 1-year Roof protection coverage. Unlike other programs, all claims are done over the phone without having to submit any documentation in order to receive service. Complete Protection is not affiliated with any type of Services Group or Network, so there will not be any phone calls to you trying to sell you added move-in services. To review the details of each coverage plan click here. I have partnered with Porch in order to provide you with Porch Home Assistant, free of charge, valued normally at $350 per year. Think of the Porch Home Assistant as a personal assistant for your move-in needs; they are there 24/7 and ready to help. They are there to help you with your checklist as you move into your new home. The most common things the Porch Home Assistant can help with include: moving, setting up utilities/tv/internet, security, locksmiths, home insurance pricing and getting quotes for any home improvement or maintenance needs (like lawn care). Porch will tailor the help according to what you say you need. Click here to read more porch home assistant gold.pdf. Ongoing, they are there for you any time you need to get maintenance done on your new home. As an added benefit, Porch has also offered $100 in coupons (4-$25 vouchers) good for my Clients when they move into their new home for discounts on handyman services booked through Porch! porch home services.pdf. You will be assigned a personal Home Assistant whom will email you after the inspection and then contact you by phone to help with any of your move-in needs, including scheduling services for items on your repair list. It is my goal and the goal of the Home Assistant to be as helpful as possible during your move-in process. If you don’t want this service, simply email the team (support-team@inspectorsupport.net) and let them know you want to opt-out or just reply to the email they send you and opt-out that way. Thereafter, they will NOT call you. If they do contact you anyway, please let me know. If there’s anything urgent you would like assistance with, you can reach Porch Home Assistant at (866) 211-4662. 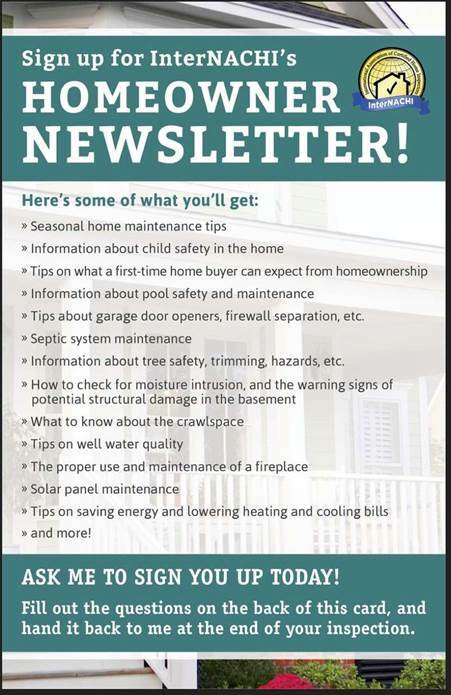 Through InterNACHI, Conley Home Inspection will offer you a free monthly newsletter (electronic emailed) that discusses home owner tips, key information, maintenance reminders, safety concerns, and other kinds of advice related to systems and components in your home. If you are a client and would like me to sign you up for this monthly newsletter, please email me saying you want the monthly newsletter and I will sign you up. All InterNACHI certified inspectors are backed by a $10,000 honor guarantee.